“QHS, headquartered in an historic site, Kingsland Homestead, maintains and explores the history of its colonial farmhouse through exhibitions, house and walking tours, and educational programs. 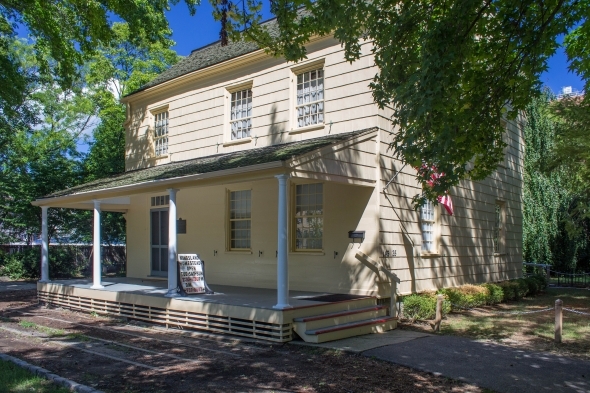 As the only museum of Queens history in the borough, the Society plans, researches and mounts a regular series of history-related exhibitions and lecture series in its gallery space totaling 1,350 square feet at the Kingsland Homestead. It also conducts walking tours of the borough. At Time Square, 5th Ave., or Grand Central take the IRT #7 train to last stop: Main Street, Flushing. Walk two blocks east on Roosevelt Avenue to Bowne Street. Turn left, continue walking until you reach Margaret Carman Green Park. Walk through the park. The Society is the first house on the left hand side. Q 13 or Q 28 to Parsons & Northern Blvds. Q 12, 14, 15, 16, 17, 26, 27, 28, 44, 48, 65, 66, to Main Street, Flushing and follow the above subway directions. Take the Long Island Expressway from the Queens Midtown tunnel to the Van Wyck Expressway. Get on the Van Wyck going north. Exit Van Wyck at the Northern Blvd east exit. Travel along Northern Blvd. past Main Street for three traffic lights until you come to Parsons Blvd. Turn right on Parsons Blvd. The first street you will come to is 37th Avenue. Make a right onto 37th Avenue. The Kingsland Homestead is on the right ont he end of the cul-de-sac.